10. Do my property's technology needs change if my project is for rent, for sale, or some of both? Condo associations might not want their telecom services from the same providers that you may contract with to provide service to renters – understand that you might need separate provisions (and contracts) for each. Also, buyers may expect more choices to be available - think multiple provider and in-unit upgrades. 9. How can residents select the phone, TV and Internet provider of their choice? Multiple providers means more choice for residents, but it also requires a more thoughtful approach to structured cabling networks. In any case, caution the architect or MEP against using any proprietary service provider designs. 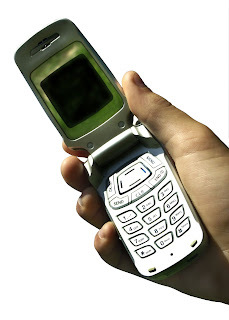 Also, consider cellular network amplifiers as many residents will rely solely on their mobile phones. 8. Does the leasing office design consider how our staff will utilize technology? The onsite staff has technology needs that are very different from those of the residents. What does the leasing staff need? Will there be terminals for residents to access the property's web portal? How can maintenance staff become more efficient? Security is also a huge issue; residents or other unauthorized folks should be on a separate network to keep them from accessing private data. 7. How will residents access wireless Internet services with minimal interference? Residents like the freedom of wireless Internet access, but it gets messy in a high-density environment if it’s not properly managed. You should consult an Internet service provider that can automatically authorize accounts and remotely manage wireless Internet access in each unit. 6. What in-unit entertainment options do you expect our residents to use most? 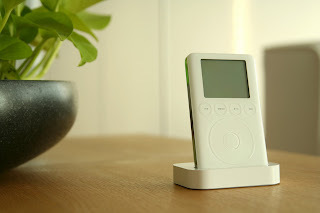 Walk through a Best Buy – flat-panel TVs, audio in every room, and iPod docks are quickly becoming the norm. Planning for your residents’ lifestyle will give them greater flexibility, reduce damages to your units (a poorly hung plasma can wreak havoc on drywall!) and enable you to offer electronics upgrades. Pay attention to the gadgets that you see people using, and keep an eye on the unique experiences that other industries offer to their customers. Think about the options you would want available to you if you were a resident. Offer something new and different, but take the time to test it for yourself - a new service won't do you any good if it doesn't offer a great resident experience. We'll have five more questions next week... by then, at the rate things change these days, we'll probably be asking ten completely new questions. Start with a central distribution point. The best way to distribute telecom services is from a Main Communications Room – this is where all the services will enter the site and are distributed up the risers or out to the other buildings. This space needs to be accessible to your service providers at all times, and may require 150 square feet of floor space or more, depending on your selected providers. 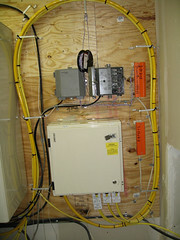 A lot of electronics will be running constantly in here, so you'll need to have adequate HVAC installed. Of course, it's imperative that this room is completely operational before the first units occupy. Depending on the size of the building, you'll probably need one or more smaller Building Communications Rooms on every other floor (or at each building) for the distribution of services (see why below). These rooms should have at least 50 square feet of usable wall space, and typically do not need HVAC... they normally can get by with a temperature-controlled exhaust fan. 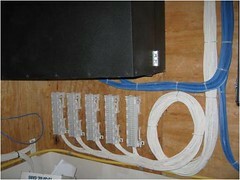 A site’s cabling backbone ideally should use optical fiber to distribute massive amounts of information, but on the resident floors, the distribution is often accomplished over copper cables. When using regular coax, video signals can only travel about 150 feet... this means that cabling run lengths shouldn't exceed 150 wire feet from the nearest Building Communications Room to the outlets in the furthest units. Because video signal distribution requires the shortest cabling lengths, you'll sometimes use a supplementary video distribution closet. This is a much smaller space – it will only house video distribution equipment – that effectively extends the video run lengths to reach the farthest points of your building. Other issues that should be addressed early on include appropriate grounding and surge protection – talk to your low voltage design consultant to determine the specific requirements for your project. Retrofitting cables and pathways once the sheetrock is up is expensive and time-consuming... it's much easier to address your property’s infrastructure needs as part of the initial planning process. Work with your design team on these three points, and you’ll be one step closer to offering the great technology services and amenities that your residents will expect and appreciate.